Danesfield House Hotel in Medmenham are hosting an Eye on the Tiger exhibition featuring 30 of the very best wild tiger photographs between 25-28 October in aid of Save Wild Tigers. This is an exclusive satellite exhibition which is being shown at the Royal Albert Hall in London. Henley school children are invited to submit ‘Tiger’ themed artworks in different age categories to get the chance to have their masterpieces on display next to these incredible world renowned photographers works at Danesfield House. 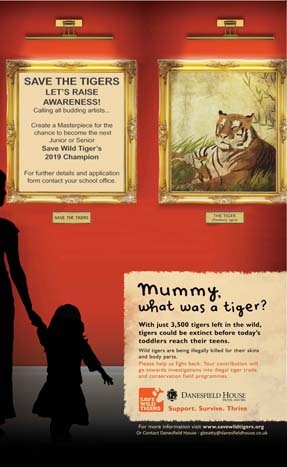 Founder of Save Wild Tigers, Simon Clinton will pick the winning pieces and the overall lucky winners will be selected to be the Save Wild Tigers Junior and Senior Tiger Champions for 2019. All winning pieces will be displayed on the Save Wild Tigers Website and the duties of the 2019 ‘Tiger Champions’ will be emailed over to the winner’s parents. One winner will be drawn and receive a prize from each age category and the Junior Champion will be aged 4-10 years and Senior Champion will be aged 11-18 years. Danesfield House’s sister spa, Spa Illuminata in London, is the official supporter of ‘Eye on the Tiger’ at the Royal Albert Hall – the unique photography exhibition that features work from the world’s leading wildlife photographers and is set to raise awareness of the plight of the wild tiger, which could be extinct in ten years if conservation efforts aren’t drastically improved. For competition entry forms please see your school office. Closing date for entries Friday 12th October. 4-6 years // 7-9 years // 10-12 years // 13-15 years // 16-18 years.